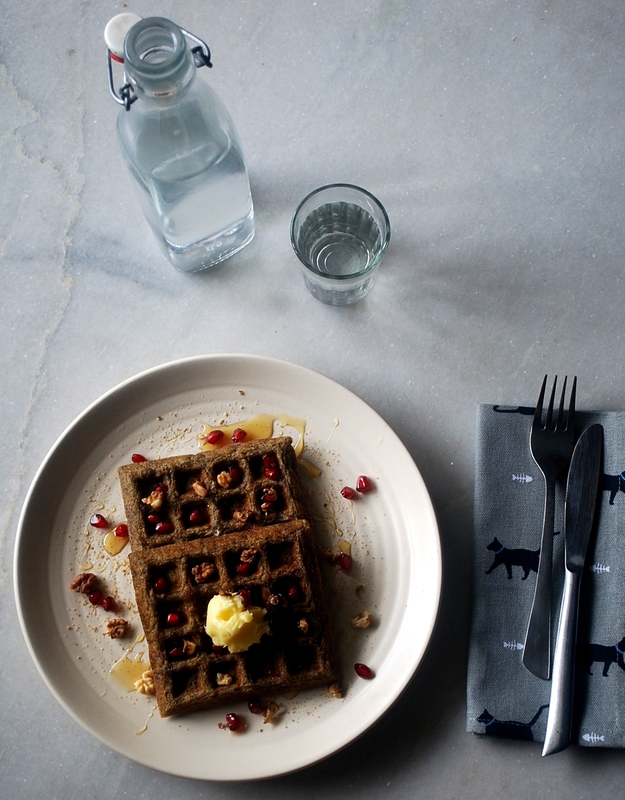 Buckwheat waffles are our new current favourite and we love to add some i2cook coconut sugar for a healthy twist. Buckwheat flour is a healthy and nutritious flour which works great for baking too. It is a good source of fiber and can substitute all-purpose flour any day! This tried and tested recipe (several times) calls for all unrefined ingredients. 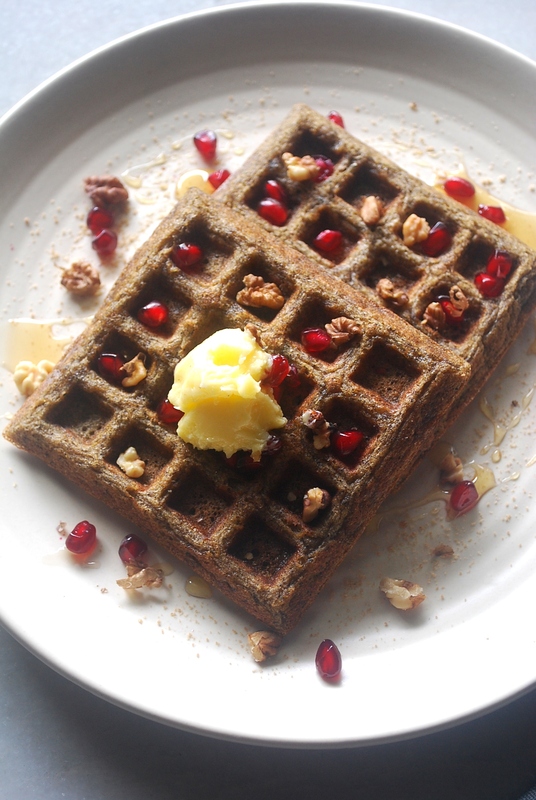 Top these waffles with some fresh cut fruits, peanut butter or drizzle some organic honey for some extra yumness! Pre-heat your waffle maker. Meanwhile, measure and mix all the ingredients well. Pour the waffle batter on greased waffle maker. Allow it to cook until crisp or done depending on your liking. Serve warm with your favourite topping. 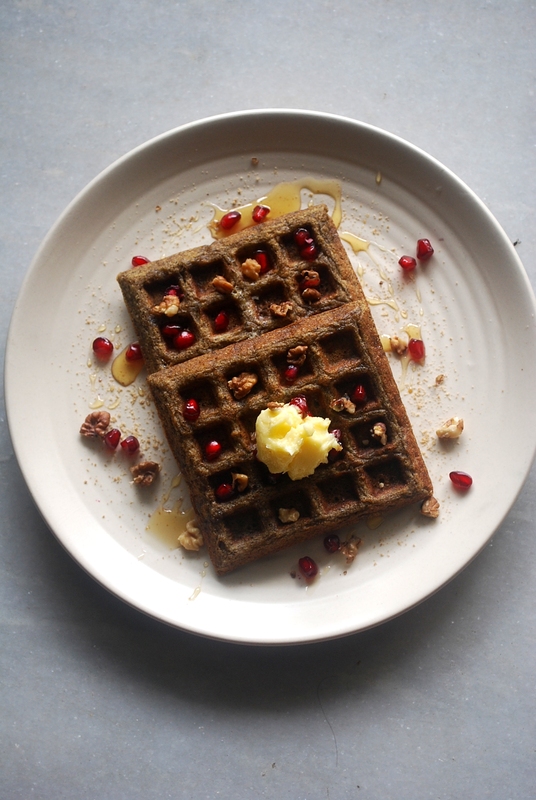 Served ours with some organic honey, coconut sugar, homemade butter, walnuts and pomegranate. If you have been a regular reader of my blog, you would have noticed that I don’t use any refined flours or any other ingredients in my baking. I have been using different kind of flours consciously or sometimes to make use of the left over flours lying in my pantry. Sharing with you a list of unrefined flours which can be used to create tasty and healthy bakes. Whole wheat flour/Atta/Chakki atta – I use whole wheat flour in almost everything I bake from cakes, breads,cupcakes to muffins. It is my best substitute to refined maida or white flour. This flour is a safe bet and if you are slowly switching over from white to whole flour, I suggest that you start with wheat flour. Your cakes or breads may turn out dense initially but you will soon learn to mix flours to give your bakes some nice body and lightness. 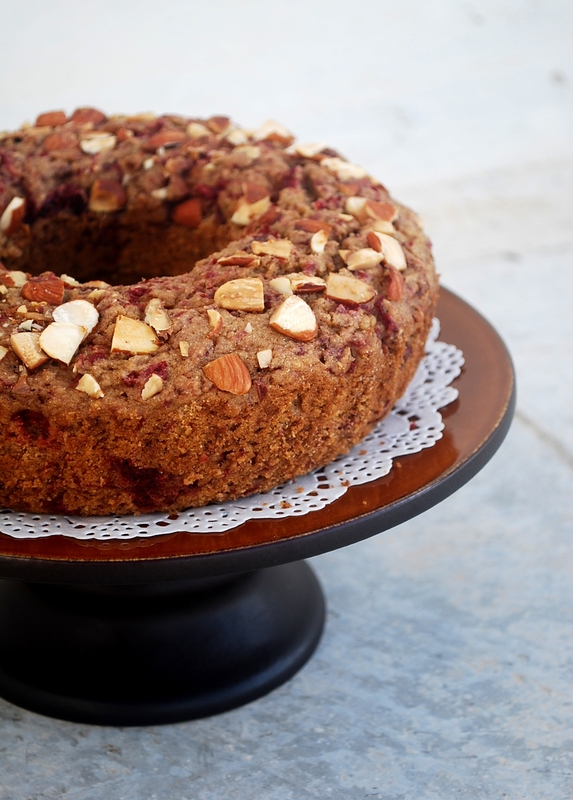 Recipe for Apple Cake using whole wheat flour. Ragi or finger millet – gluten-free and can give a little sandy taste at times. I personally, like to mix ragi with either one or more flours and some almond meal to combine a nutty taste. Recipe for gluten-free banana bread or egg-less chocolate cupcake. Amaranth flour – this gluten-free and high on protein flour can be used in combination with various flour mixes. Amaranth flour tends to impart a strong flavor which may not be appealing to some. However, if the proportion of this flour in the baked item is less, you can add only the amaranth flour, like the gluten-free brownies or chocolate cake. Trying using amaranth & chocolate together, they are a match made in heaven! Recipe for Amaranth Brownies. Brown rice flour – It is best to use in very small proportions. Brown rice flour is high on fiber as compared to the white flour. This flour can be used to make banana bread or cookies. Buckwheat or Kuttu – this rarely found nutty flour can be a baker’s delight. Buckwheat like amaranth goes extremely well with chocolate and can be used in a lot of your baked dishes. Recipe for Chocolate Cake. Corn flour or makki ka atta – This is another flour which should be used in small proportions, mixed with other flours. It is high on fiber. Do not confuse this flour to the refined corn flour which is used in Chinese dishes. Cornmeal – Corn meal is also famously known as polenta. It is called polenta because the consumers don’t confuse it to be made of any other dish and also to indicate that it is ideal for making polenta. I had made this delicious cake with this ingredient once. This ingredient is coarse in nature unlike other flours. The other types of gluten-free flours are bajra (pearl millet) or jowar (sorghum) which I’m assuming will work well when mixed with other flours. These flours work great in combination, rather than using just one flour due to its non-glutenous nature. Whole wheat works great for baking breads but you could also use finger millet or amaranth for that extra nutrition. You can also find mixed millet flours available in most of the organic shops which I’m yet to try. Different recipes call for different flours and I’ve been trying to include as many flours I can in my baking. The choice of using flours is up to you but the proportions is what you should be looking at closely. For eg: If you are using whole wheat and finger millet in a recipe, you could use 2:1 or can be even reduced to half the quantity in some recipes. The reason being that finger millet and most other flours come with a strong flavor and sometimes may over power your baked dish in taste and colour. Here is a quick recipe for you to start getting acquainted with unrefined ingredients. Bake for 40 minutes. Once done, allow it to sit for 10 minutes in the pan, before transferring to a wire rack for cooling. Eat warm with your favorite choice of toppings. 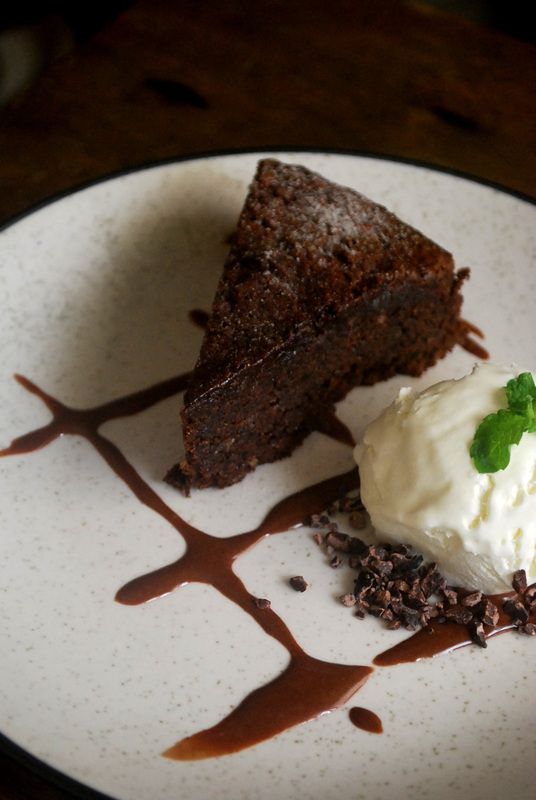 Keep calm and bake some chocolate cake…. There are days when I’m down or just worked up! I don’t like monotonous work and I do take some productive (ahem) breaks. My logic is very simple, when the pressure at work is too much for me to handle, I just bake. Simple. Bake. 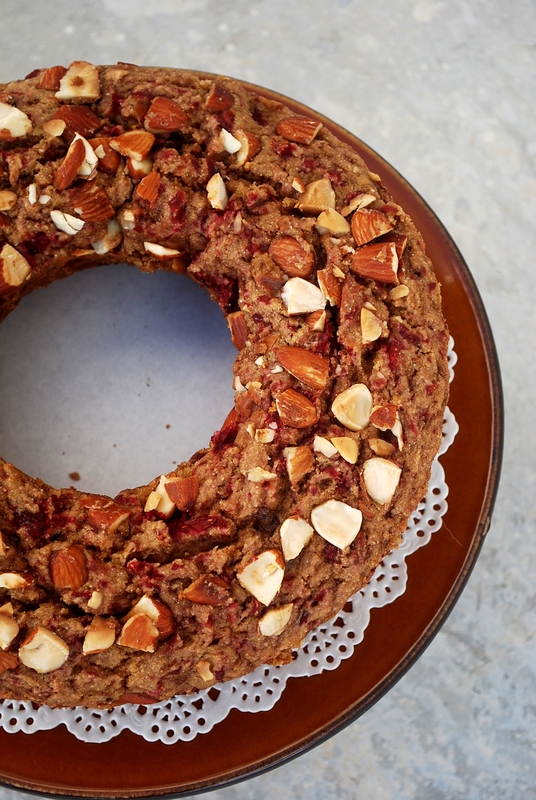 Bake bread, cookies or just simple cake. I baked this chocolate cake like three times in less than two months! (God save me from the calories). Once I have like a big unit producing tons of peanut butter, I shall dedicate a room for me. I will have an oven and only bake whenever I feel like taking a productive break ;). 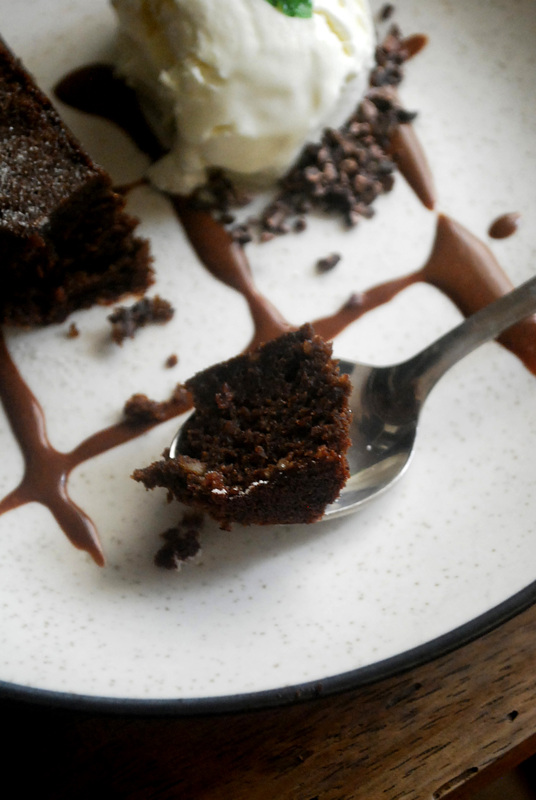 This chocolate cake is simple and gluten-free. 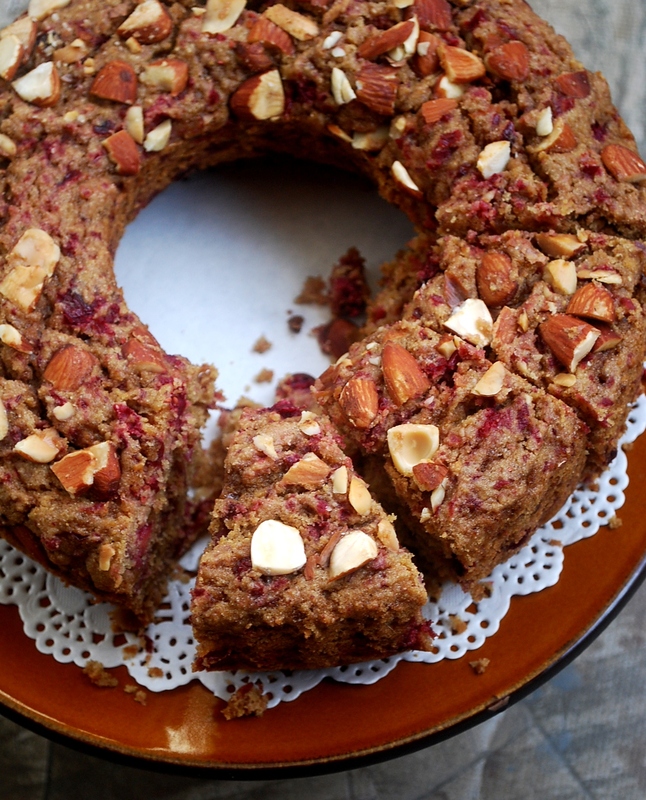 I was inspired to make this cake by Smitten Kitchen but I’ve made some changes by trial and error. All the ingredients are meant to be with each other, buckwheat, almonds and dark chocolate is a marriage made in heaven. This cake asks you to bake. Trust me. That is why I ended up making it three times before posting the recipe. Mix the chocolate and butter in bowl and place it on a double boiler. Allow it to melt completly and keep aside. Measure raw sugar in a bowl and break three eggs. Beat it for atleast 10 minutes or till you get a thick and pale yellow mixture. This is the most important part of the cake and a little muscle work (or a fancy gadget) can give you that super crumbly texture. Gently fold in the melted chocolate mixture. Sprinkle the buckwheat and almond meal over the batter and fold gently to combine. Pour into prepared pan and bake for about 25 minutes. 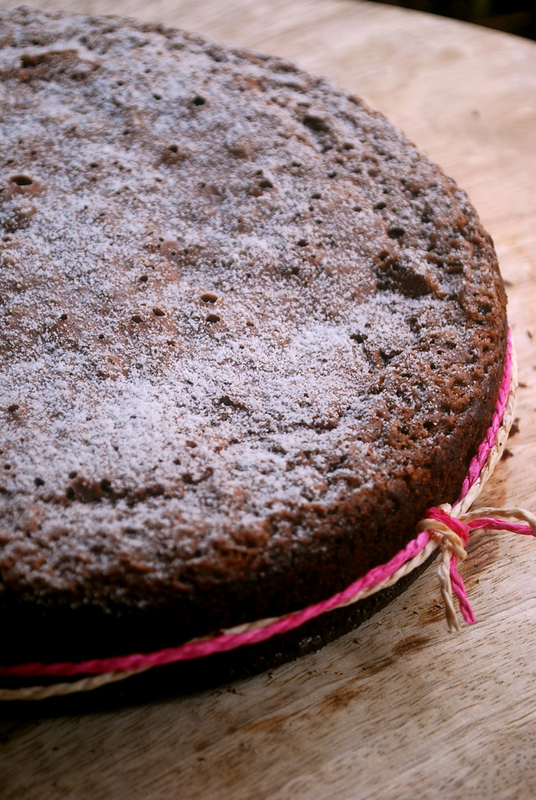 Check for doneness by inserting a toothpick in the center of the cake and it should come out dry. Let cool for 5 minutes in the pan and invert onto the rack. Serve warm or at room temperature dusted with powdered sugar or dolloped with lightly whipped cream or your favourite ice-cream. I used organic raw sugar & cocoa beans for plating from i2cook.com.